Hello everyone 8D I am new to the Naked Science Forum, but I've been watching your discussions for a little while and felt it was time to ask some questions of my own. I only have a rudimentary understanding of physics, both classical and quantum mechanical, so I hope to learn things even if I can't have my questions definitively answered. The physical exchanges occurring in a moving automobile are all based on very fundamental and tractable concepts (kinematics, angular momentum, torque, friction, air resistance, etc.) but it quickly gets really complicated. I could spend a long time meticulously outlining all of the little things going on with a car, but instead I will refer you to this series on the physics of racing if you should feel you are interested http://phors.locost7.info/contents.htm [nofollow] and to https://thescienceclassroom.wikispaces.com/Physics+of+Racing [nofollow] if you just want to be briefly reminded of what forces are 'most important' when considering a car's movement. I'd like to preface my question by saying I looked over everything on that first webpage a few months back and found nothing to answer my question, which is based on the colloquialism we have all heard about driving a car fast: 'Accelerate through the apex of the turn for more control [and/or] traction.' From a physicist's perspective, can this advice be validated? If so, how could this be explained in terms of forces? Sounds like a dare devil approach to a curve. Myself I let it roll, but then again, I'm a coward . That is a bike though, for a car with low, what do you call it? height? never mind? And four wheels you might accelerate and get a controlled 'slide', coming out of it accelerating. The best thing might be to ask those surviving it repeatedly. The Finns like it. Or, maybe not?? Da*n it, why can't you guys use a civilized language? For a bike you go into a curve but you don't try to slide through it, after you got it pointing in the, approximate, right direction you can accelerate again though. and for a car you got more mass resting on four wheels, keeping it low, so you have more control, as I think? But it depends, I'm talking street bikes. The "acceleration circle" of a car refers to the combined accelerations acting on a car — the longitudinal accelerations due to speeding up or slowing down, and the lateral accelerations due to cornering. This "circle" may actually be somewhat elliptical. This circle shows the limits of accelerating the car — that is, the tires on the verge of losing traction due to the forces from these accelerations. The apex of a turn probably refers to the "tightest" part of a turn of a car negotiating a curve in the road. The driver knows this apex by the most extreme turning of the steering wheel to the right or the left. Thus, the greatest lateral acceleration occurs at the apex. If the driver wants to accelerate "through" (ie, before, during and after) the apex, the driver must not steer through the apex at the maximum allowable lateral acceleration for the speed, because accelerating longitudinally (ie, stepping on the gas or brake) will cause the resultant acceleration (ie, the combination of the longitudinal and lateral accelerations) to exceed the acceleration circle, and the car's tire(s) will lose traction, the driver will lose control, and the car will/might crash. I do know that, if the driver has reached the maximum lateral acceleration at the apex of the turn (ie, the tire(s) on the verge of losing traction), then as the driver comes out of the turn (ie, the driver begins to return the steering wheel to neutral), s/he can carefully begin accelerating longitudinally (ie, either applying more gas or brake) to allow maximum longitudinal acceleration without exceeding the acceleration circle. 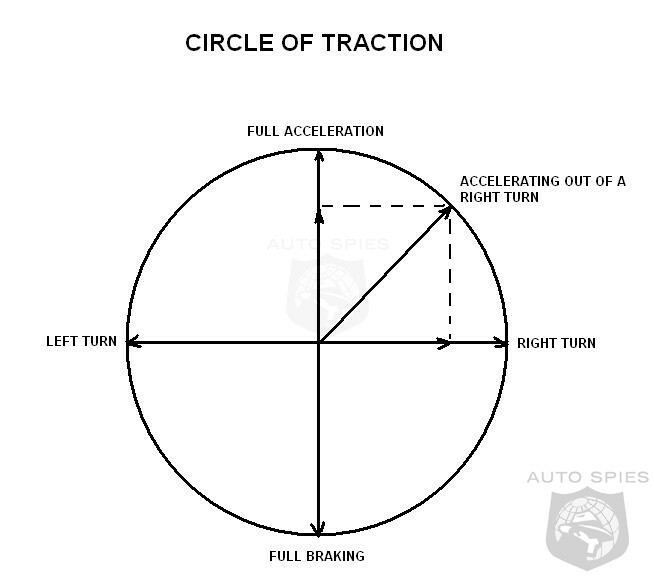 I think my term "acceleration circle" is now out of date as I see on the Internet the use of "traction circle" and "circle of traction" (see diagram below). The resultant force shown in the diagram could well describe a car coming out of a clover leaf while accelerating up to highway speed. If the driver turns the wheel "tighter", then the arrow's tip will move to the right and exceed the traction limit and the tires will break away. If the driver applies more gas, the arrow's tip will move forward and exceed the traction limit and the tires will break away. So the skill involves carefully applying more gas while bringing the steering wheel back to neutral. When done to maximum effect, the arrow's tip will remain just inside the traction circle (ie, just on the verge of losing traction) as it moves from a purely right turn at the apex to a straight-line acceleration when entering the highway. I'm sorry for my lousy description here. I tried my best. If confused, ask a question, and I'll answer it. I know that I did NOT answer your question about accelerating through an apex for more control/traction. I gave you the description of how to negotiate the turn at the highest speed, which racers try to achieve. Maybe there are two definitions of it? The Finns I've seen let the wheels lose traction, sliding the car through the curve? Or maybe there is some sort of traction still, although dynamic? Or as long as you have the glide, the wheels not having a traction, your car turns in the direction you set it coming into the curve, but a soon as your front wheels point in the same direction as the glide you get full traction back, as your front wheels cooperate with the glide? Re: Is "accelerating through the apex of a turn for more control" sound science? There are two-wheel and four-wheel "drifts", and I'm at a loss to explain their advantages, although the link here on drifting may explain it (I have not read it). Tires slipping on the pavement reduces its µ (traction coefficient), because a dynamic µ is less than a static µ. This video shows drifting. Page created in 0.169 seconds with 47 queries.